(Twice per year) Parents sit inside the dance room to observe your child's progress. This gives the student a sense of accomplishment as parnts share a sense of hard work and joy experienced in class. Invite a friend your age to have fun taking class with you. Students who miss more than one third of their classes during the twelve weeks before the performance, or more than 50 percent of the total yearly session classes, may not be allowed to perform. The Spring Performance Dress Rehearsal is mandatory for all performing students. Ballet: Females - Black leotards. Pink tights and ballet shoes. Hair pinned up and secured. Men - White T-shirt, dark tights, white socks, and shoes. 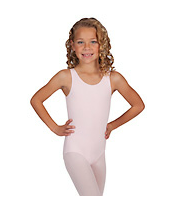 Jazz or Tap: Females - Leotards, transition tights or jazz pants - black or solid dark color, jazz shoes/bare feet. Men - sweat pants and T-shirt. 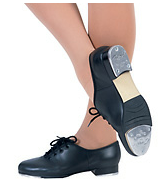 Tap shoes - low or high heels for adults. Princess Pre-Ballet / Pre-Dance: Pink leotard, tights, ballet shoes (no tutus).